Combine ground chicken, mac & cheese and black beans with cumin, onions and chunky salsa to make this fiesta-worthy dish. Chicken and Black Beans with Cumin can serve six. Heat oil in large nonstick skillet on medium-high heat. Add chicken; cook 5 to 7 min. or until chicken is no longer pink, stirring frequently. 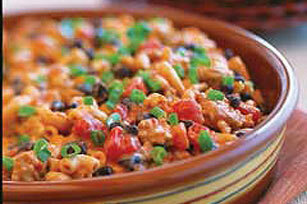 Add Macaroni, water, salsa and cumin; mix well. Bring to boil; cover. Simmer on medium-low heat 10 min. or until most the water is absorbed. Stir beans and Cheese Sauce into macaroni mixture; cook 2 to 3 min. or until heated through, stirring occasionally. Sprinkle with onions. Serve topped with sour cream. Prepare using your favorite variety of canned beans, such as pinto beans.